Venezuelan textile artists, Mariá Dávila and Eduardo Portillo describe their work as “driven by our relationship with our surroundings and how it can be communicated within a contemporary textile language.” Their hometown is Mérida, deep in the Andes Mountains, and like archaeologists they have been exploring this countryside for years, finding traces of human life in the topography. Centuries-old switchback trails or “chains” that historically helped to divide farms and provide a mountain path for farm animals have recently provided inspiration and the theme for a body of work, Within the Mountains. Nebula is the first from this group of textiles. 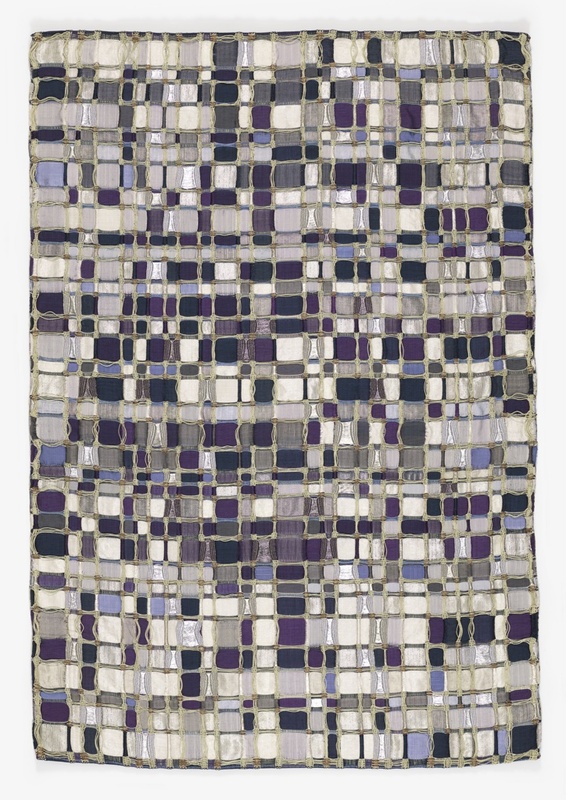 Davila and Portillo describe Nebula as “an imaginary celestial body inside the mountains.” Using primarily natural dyes and a combination of indigenous palm fiber (moriche), silk produced on their farm, and metallic fiber, Davila and Portillo’s Nebula is a mosaic of light and color. It is a triple weave structure with two warps: one made using a combination of very fine 22 denier silk and coarser 300-400 denier silk; and the second made from moriche that gives shape to each mosaic cell. Davila and Portilla explain that “the metallic yarn and copper filament are the light,” and help to bridge the piece while providing a new dimension in their pursuit of color. Davila and Portilla love process and are especially interested in those methods that bear the imprint of people and places, and reveal the relationships between people and their environments. When they decided to work with silk, they traveled to China and India to study and research sericulture, which they brought back to Venezuela. They choose to work with predominantly regional materials, such as cotton and alpaca from Peru and Bolivia, palm fiber from the Orinoco River Delta and Amazon region, and locally grown indigo plants. Color is crucial to their work and they are interested in how it is obtained, where it is found in nature, in objects,and in people. Matilda McQuaid is the Deputy Director of Curatorial and Head of Textiles at Cooper Hewitt, Smithsonian Design Museum.